President Barack Obama has landed in South Africa, the second stop in his three-country tour of Africa, amid vigils for Nelson Mandela. Barack Obama said earlier he did not expect to see former President Nelson Mandela, who is critically ill in hospital. Meanwhile, Nelson Mandela’s ex-wife, Winnie Madikizela-Mandela said the former leader had made “a great improvement” in recent days, but was “still unwell”. Correspondents say security is tight in the streets near Mediclinic Heart Hospital in the capital, Pretoria, where the 94-year old is being treated for a lung infection. Ministers, politicians, Nelson Mandela’s physician and family members were among those visiting the ex-leader on Friday, his 21st day in hospital. Barack Obama’s plane landed at a military airbase near Pretoria on Friday evening. He has meetings scheduled in the capital on Saturday morning. But Barack Obama said earlier he did not expect to see the ailing ex-leader during his visit to South Africa. “I don’t need a photo op,” the president said aboard Air Force One after leaving Senegal. Barack Obama met Nelson Mandela in 2005 when he was still a US senator. Both men became the first black presidents of their nations and have received the Nobel Peace Prize. 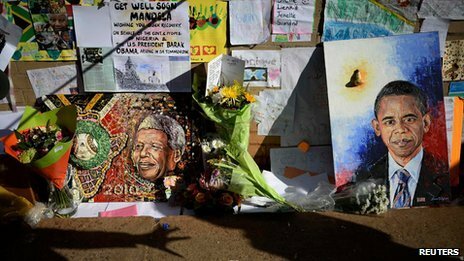 The US president has described Nelson Mandela as a “hero for the world”, whose “legacy will linger on through the ages”, and who had inspired his own activism as a student. She also thanked domestic and international media for their coverage, but added that some of the reports had caused the family distress. “We had no idea of the love for us out there,” she said. “There may be problems here and there when some of you get carried away and talk about our father in the past tense,” she said. Earlier this week, Nelson Mandela’s eldest daughter criticized the international media camped outside the Mediclinic Heart Hospital, calling them “vultures”. People in South Africa are anxious about Nelson Mandela’s health but also want to express their pride in the man many consider the father of the nation. South Africa’s ruling African National Congress (ANC) said it would hold vigils each day that the former leader remained in hospital, and the distinctive black, green and gold colors of the party are much in evidence. But the party denied it was exploiting the occasion to canvas for votes ahead of next year’s elections. “We love our ANC regalia and we have every right to wish Madiba well,” party spokesman Jackson Mthembu said. Meanwhile, a court in the Eastern Cape has granted an application brought by the Mandela family to exhume three of his children and two other relatives and rebury them in the family cemetery in Qunu, which is where the former leader wants to be buried, their lawyers say.